sanctions, restitution, and compensation claims. 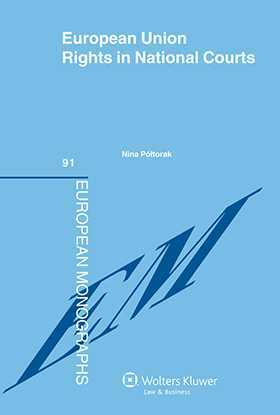 Through her meticulous reconstruction and systematisation of the elements that constitute the whole process of execution by national law of rights granted in EU law, the author clearly manifests the extent to which the system as it stands affords the guaranteed level of legal protection. With practical recommendations pertaining to individual legal remedies present in national law – how they must be understood and modified in national court jurisprudence, and what are the rights of an individual demanding that an EU claim be enforced – her thorough analysis of the relevant EU law provisions and the corresponding requirements on national instruments will be of inestimable value to the community of practitioners, jurists, and academics working at the interface of EU law and the law of the Member States.